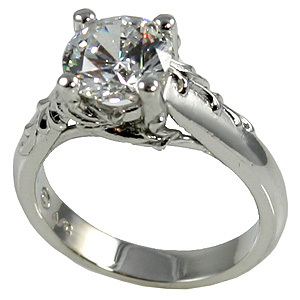 Stock #PL17807L:Platinum Antique style Floral Solitaire Ring. This Gorgeous russian CZ is more precisely cut & polished of the best CZ quality available... VERY NICE HEAVY RING. Weight approx 6 grams for 1 carat version, 7.5 grams for 1.5 and 2 carat version and 9 grams for 3 carat version. Also available in 14k Yellow gold, 14k White Gold.